These are rough ideas. Just want to see if we're in the neighborhood. If you like where we're headed, I'll make a materials mock up for you to see. My mom thought that the designs grouped at the larger fret spaces only seemed a bit lopsided. I like the way they look spread out on the fingerboard. As for the other 5 positions, they can be marked with side marks only, or maybe something simple like dots. What do you think? How about a larger Peace Sign below the tail peice on the body of the guitar, then space the other four symbols along the fret board? I love the Sun and the Saturn! The star is a little plain, and the rose/heart is a little complicated. I tried to send this post weeks ago, and I guess it did not work...sorry! A larger peace sign below the Tailpiece sounds great. I don't see how I can get the Rose/Heart any simpler since the request was for a 5 petaled rose, one petal for each member of the family (the center bud doesn't count) It was difficult to get it to look like a rose with any fewer petals. You only see the last drawing not the ten I threw away. 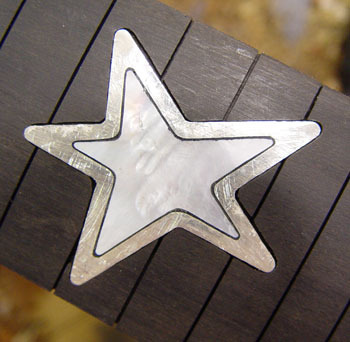 The Star I'll put further down and make it a little larger encompassing several frets and have it in mother of pearl outlined in silver. My thoughts on the star since it's for the youngest member of the family is that he's reaching up to his brothers. Maybe I'll get a better feel for the Rose/Heart with a more finished image. I like your on the Star. 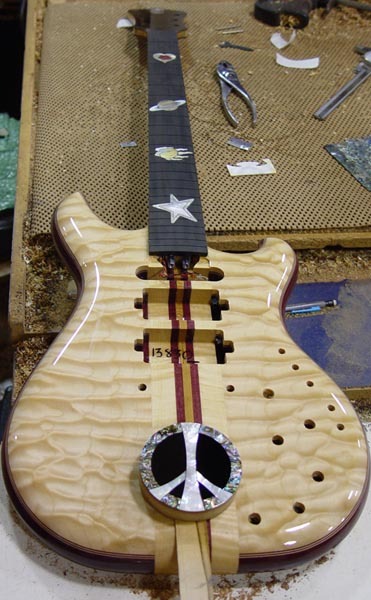 You indicated that the guitar is built...do you have any photos you can post? I would love to see what you have! Welcome to the club. 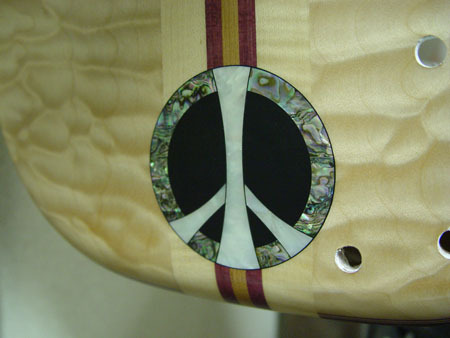 I really like the inlays, so far, especially the idea of a larger peace sign below the bridge. What type of guitar are you having built? Thanks for the "welcome". It is a Further. 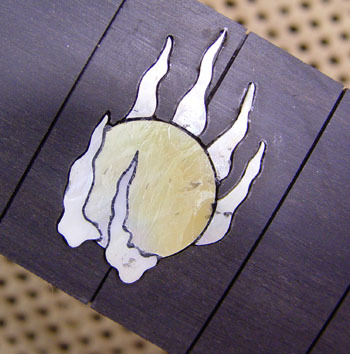 I am really excited to see the inlay work progress. We should see some pics of the base guitar soon. Cool! Welcome to the "club". Hurrah ...one six-stringer on the higher frequencies more on this club. That's a good thing! I would go for the "peace" sign below the bridge. the sign as described on the scetch above, and we all know as the "peace" sign, was ever showed to me as being based on an old rune that symbolised "Death". If you turn it upside down it would be "Life". I could be wrong but "life" could be more appropriate for this guitar. Of course we ALL have -and I bet you in the first place- THIS (what you designed now) sign in mind as THE peace sign. "Rune" wise it doesn't make sense I think. Well ...just my ideas ...you know ...I'm "bad". You are right about thespirit of this guitar...life and love is the idea. The symbols are for specific members of my family, so they mean a lot to me. I have not heard about the "Death" association with the Peace Sign...it has always stood for tolerance and, well, peace. Of course, this is just on an random Further, not on your specific guitar. I had you fingerboard inlays rescaled, but somehow I failed to save it properly, so I'll redo that in the morning. Wow that is awesome looking! 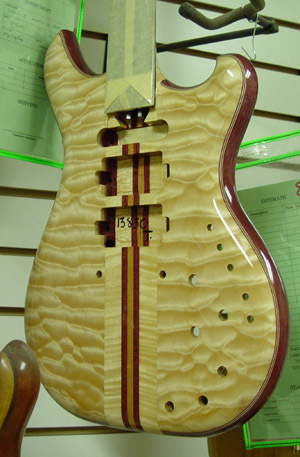 I love the quilted maple, you got some fantastic wood for this one. What's that center stripe between the two purpleheart stripes? Offsets everything very nicely. The frets are shown slightly wider than reality, but I find it helps in design to really steer clear of them. 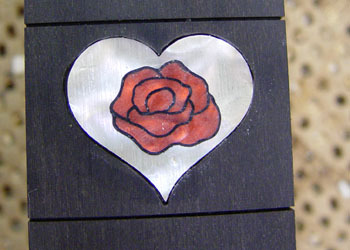 The rose is scaled down within the heart. 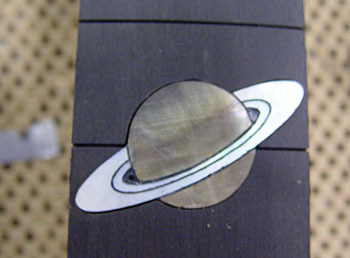 The four fingerboard inlays are spaced for visual balance. Once we get the line art approved, I can make a mock up with materials. Hey, what's the extra hole in the control cavity for? That's an on/off for the side LEDs. If you see tape in the neck pickup while the guitar is in spray, it's usually protecting the wires from the finish. 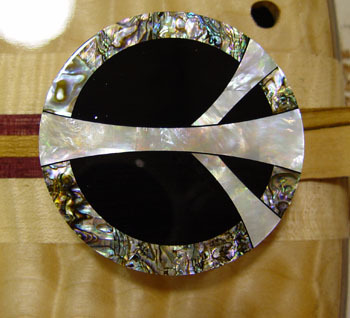 Mike picked a cool piece of Tahitian mother of pearl for the disk - it mimics the faint banding on Saturn. This shot is the darkest view, it's a very active piece of shell. The rings are white mother pearl. To get Cassini's division, Mike held his breath and sawed the ring - it's too small the file later. Hard to tell how cool this looks. Agoya and golden mother of pearl. 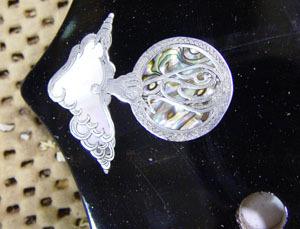 White mother of pearl framed with sterling silver. This was actually still wet in this photo, but mom couldn't resist placing it for the pictures. There's some really neat grain in the Ebony, but it's impossible to see unless you see it in person. Here's some idea of scale. 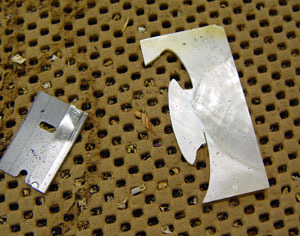 Since Mike had just finished these, I found an identifiable scrap of mother of pearl. Well, who would want any more proof of the great craftmanship Alembic offers! The fingerboard inlays aren't entirely to my tase to be honest, but the body inlay 'cartouche' is absolutely stunning! This'll be a truly unique guitar! Wow! Very nice quilted top. Is that a standard top or upgraded to 5a? but this is under a prepped surface of the finish when it's sanded between coats. Gosh ...the birth of a classic!!! oh ...and a LOT of scrap to make boxes!!!! 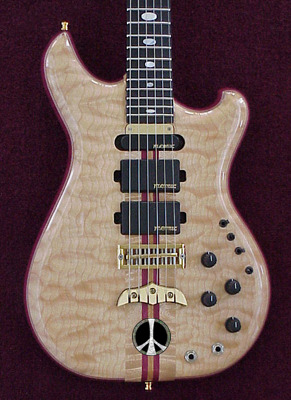 I just can't stop smiling while looking at this guitar. Not only is it beautiful, but it denotes a certain sense of whimsy. It looks like a party getting ready to happen! I love this guitar. What a blast! I am really happy with the way it looks...it captures the spirit that I was going for. I can't wait to play it and get the party started!